Reliance Jio is giving users up to 10GB of free data to mark the second anniversary of its commercial operations in India. 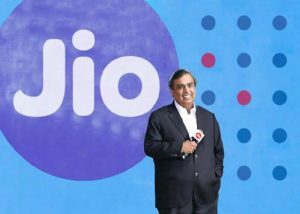 In the past 2 Years, Jio has completely changed the scenario of 4G data in India and claims that users now consume over 240 crore GB of 4G data on its network every month. The telecom operator currently boasts of a subscriber base of over 215 million recorded till June 30, as per data shared by the company. Reliance JIo celebrate its second anniversary, it is providing customers more data, something it has done time and again. The new Jio Celebrations pack provides users 2GB of additional 4G data per day, over and above their current pack. Jio users can avail free data under Jio Celebrations Pack where all Jio prepaid and postpaid users are getting up to 10GB data for five days. 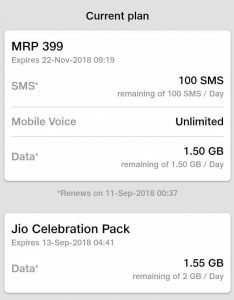 The free 2GB per day data is available to users from 9 September to 13 September, which means Jio users are getting up to 10GB data for five days. Prepaid and Postpaid users can check their account details via MyJio app following steps listed are below. Download MyJio and open MyJio app on your smartphone and log-in. Then tap on to your plan details. Under your current plan, the Jio Celebrations Pack will be visible with 2GB per day quota. Once users burn out the free 2GB daily quota then they will switch to their existing plan. Reliance Jio users won’t need to do anything to avail the Jio Celebrations Pack as it is complementary for all users.